03 September 2010– Adding to the carnival atmosphere this year, the 2010 FORMULA 1 SINGTEL SINGAPORE GRAND PRIX will feature workshops by artists, live demonstrations, behind-the-scene tours, artistes meet-and-greets and an entertainment village. For the first time, the week-round programme of events, workshops and showcases organized by Singapore GP will be led by the artistes and performers, and will seek to involve the active community of students, bike enthusiasts, and budding artists through an interactive experience in chalk-drawing, freestyle bike demonstrations, drumming sessions and martial arts workshops. The S$5 million entertainment line-up is included within the price of the race ticket. With more than 300 performers on 10 stages throughout the circuit park, the 2010 FORMULA 1 SINGTEL SINGAPORE GRAND PRIX provides an unprecedented entertainment lineup. For the first time in Singapore, four of the world’s best freestyle trial bikers will perform a high-action choreographed stunt bike show on the floating platform, exclusively for Bay Grandstand patrons. Australian Jack Field and Frenchmen Julien Dupont, Chris Braund and Johan Picas, who placed top 4 in the World Freestyle Trials Championship, the Red Bull X-Trial Jam, will wow audiences with their incredible skills and daredevil stunts such as 180 and 360-degree spins and high-level stalls. 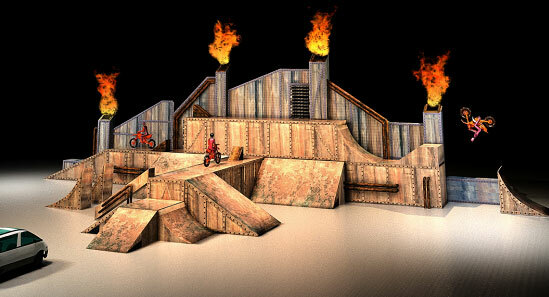 The stunts will be performed on a specially constructed 50-metre wide and 12-metre high outdoor stage setup with obstacles, half-pipe ramps, high slopes and fire spectaculars, against the stunning backdrop of Singapore’s Marina Bay skyline. All ticketholders and trials bike enthusiasts can now win a behind-the-scenes tour and stunt demonstration workshop with two of the world’s best professional trials bike extremists Jack Field and Julien Dupont. For the first time, the two bike professional will team up and present a workshop outlining the tricks of the trade, balancing techniques, stunt biking, and proper bike and gear preparation for stunts. 25 lucky patrons will get a first hand learning experience complete with a chance to get autographs and photos with the stunt bikers at the Circuit Park on 25 September 2010. To participate, ticketholders need to register their ticket transaction number (listed on the confirmation email or receipt) on the official Singapore GP website, www.singaporegp.sg. Applications for this draw will close on 15 September 2010. Only Bay Grandstand patrons can exclusively catch the freestyle trials bikes show on all three days with their three-day pass, priced at S$298. The bike show is not available to other ticketholders. 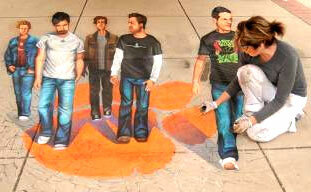 Bringing street painting to a new paradigm is Tracy Lee Stum, one of the world’s top chalk artists. The holder of a Guinness World Record for the largest street painting by an individual, Tracy is able to draw three-dimensional scenes that look incredibly lifelike on pavements and public roads. Ticketholders in Zone 4 will be able to watch firsthand the creation of her masterpiece from Friday to Sunday of the race weekend (24th to 26th September 2010). Tracy will also be partnering a local arts institute to organise a series of 3D street painting workshops from the 24 to 26 September 2010. Led by the artist herself, the workshops, held within the Circuit Park, will provide information, instruction and hands-on experience in rendering an enlarged image in accurate perspective. Tracy’s first artwork will be ready for viewing in Zone 1 by Friday while the second, in which she collaborates with the arts students, will be completed by Sunday. These world masters in Capoeira will entice and entertain with an extraordinary show that combines the Brazilian martial art of Capoeira with the live music and dance of Rhythm Carnival, Brazil’s hottest samba band. 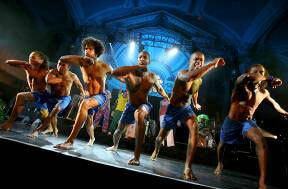 Members of Rhythm Carnival have performed with Santana, The Fugees, Ricky Martin, Sergio Mendes and The Black Eyed Peas. Spectators can expect high-energy acrobatics flips, leaps, high kicks and spins performed at breathtaking speed from the Brazil! Brazil! daily at the Marina Bay Street Circuit. Patrons keen to trying their hand at Capoeira or Brazilian drumming can also participate in free interactive workshops conducted by Brazil! Brazil! on 25th and 26th September at the Esplanade Park Stage. As part of a community outreach programme, the Brazil! Brazil! will also be conducting similar workshops for Soul Percussion and Capoeira Club students at ITE College East on 24th and 25th September 2010. The above workshops are in addition to the previously announced star-studded entertainment acts for the 2010 FORMULA 1 SINGTEL SINGAPORE GRAND PRIX, which include Mariah Carey, Missy Elliott, Daughtry, Adam Lambert, Raphael Saadiq, Sean Kingston, Chippendales, Studio Festi and DIV4S.